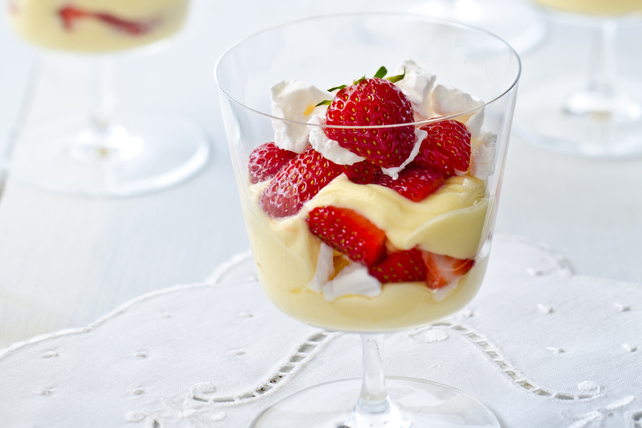 Layer half each of the pudding mixture, strawberries and meringue evenly in 8 dessert glasses. Repeat layers. Eton mess is an old English dessert that's delicious but resembles a "mess." For a more authentic presentation, ask your guests to make a mess of their desserts by stirring them up to evenly distribute the meringue pieces in the pudding. If you can't find meringue nests, you can use meringue cookies instead. Just crumble enough cookies to measure 3 cups. For best results, assemble the desserts just before serving so the meringue stays crisp. You'd never guess that this great-tasting version of a classic English dessert can fit into your healthful eating plan. As a bonus, the strawberries provide an excellent source of vitamin C.